I made some animation for Alan G. Parker’s feature documentary Who Killed Nancy? last year and it was released in February. It played at cinemas in London and around the country and it’s now out on DVD. Nick Rutter, the film’s DOP, contacted me and asked me if I would be interested in working on the film. The production team at Bill & Ben had decided that the budget wasn’t going to stretch to the archive footage that’s available and to fill in the gaps needed to tell the story with animation. Although it sounds like a patch up job it actually turned out pretty well with the different styles of animation complementing the punk aesthetic of the subject. Above is a still from a sequence in the film where the part played by Max’s Kansas City in New York is discussed. It was the club where Sid Viscous’ new band had a residency shortly before Nancy Spungen died. I wanted the animation to have a hand made feel to reflect the times. Below is a shot from a sequence of the exterior of CBGB’s in New York. The figures, taxis and buildings were traced with marker pen on to acetate and then scanned for compositing. Below is a still from a sequence depicting Sid Viscious’ Heroin addiction. In this sequence I treated the images to look they had been produced by silk screening to look like album cover artwork of the period. Below is a still from the sequence about the graffiti in CBGb’s slagging off Nancy Spungen. 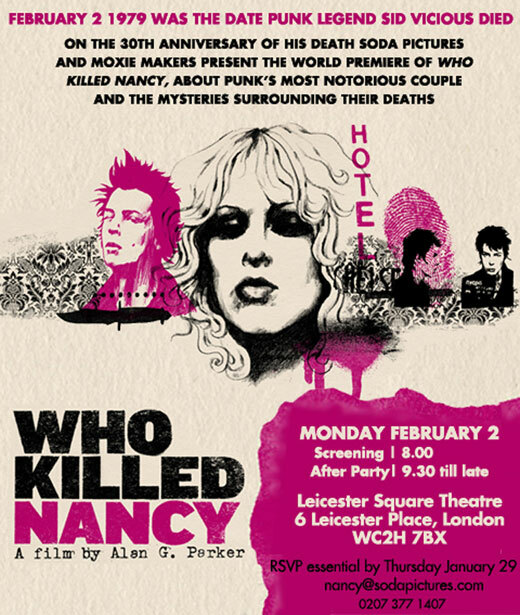 There are several sequences in the film that cover the events in Sid & Nancy’s room in the Chelsea Hotel on the night that Nancy Spungen died. this still shows the location of fingerprints found in the room. And here is the flyer for the Preview, which didn’t happen of course because it was The day it snowed. This entry was posted in Documentary, Motion Graphics, Video. Bookmark the permalink. Both comments and trackbacks are currently closed.